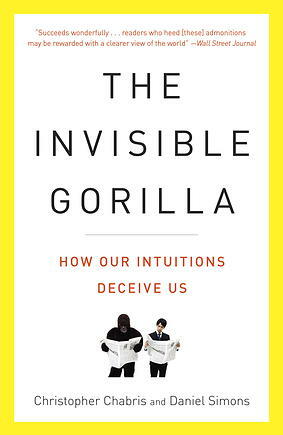 Psychologist, neuroscientist & author of The Invisible Gorilla on how our intuitions deceive us. How can we cope with information overload? With more data coming at us from more sources than ever, it’s more likely than ever that we will miss critical information when making crucial decisions. In this talk Christopher Chabris, creator of the famous “invisible gorilla” experiment that reveals how much we fail to notice, explains why we miss so much and uses compelling research studies and real-world stories from finance, medicine, politics, science, and even the world of art forgery, to provide ideas and strategies to help us all see what we’re missing. When the comedian Henny Youngman was asked "How's your wife?" he answered "Compared to what?" Every decision we make, no matter what kind, involves a comparison of options. Or at least it should. But sometimes we don't consider options, don't consider the right options, or don’t even realize that options exist. 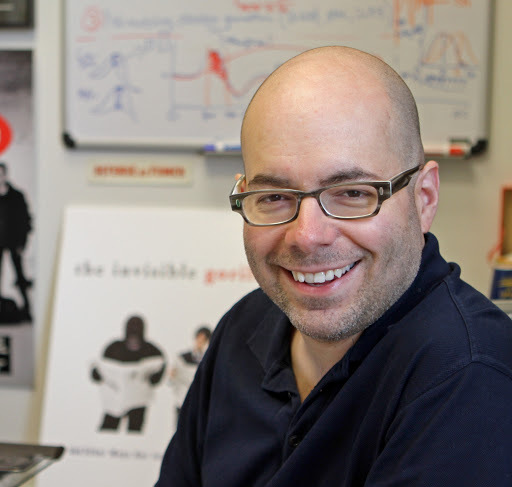 In this talk behavioral scientist Christopher Chabris, creator of the famous “invisible gorilla” experiment, uses entertaining real-world examples to explain why we often fail to make the right comparisons and show how reminding ourselves to ask "compared to what?" can improve our decision-making. Everyone who is part of an organization—a business, a nonprofit, a condo board—has experienced the useless meetings, dysfunctional committees, buck-passing, and other pathologies that can occur when human beings try to work together in groups. But it doesn’t always have to be this way. In this talk cognitive psychologist Christopher Chabris explains the latest science that shows how and why some teams are smarter than others—why some groups solve more problems and get more done in less time—and suggests how you can apply the lessons of this research to improving the teams you participate in or lead. Christopher Chabris received his A.B. in computer science and his Ph.D. in psychology from Harvard University, where he was also a Lecturer and Research Associate for many years. He did postdoctoral work in brain imaging at Massachusetts General Hospital. He is currently a Professor at Geisinger Health System and a Visiting Fellow for the Institute for Advanced Study in Toulouse, France. Formerly he was an Associate Professor of Psychology and co-director of the Neuroscience Program at Union College in Schenectady, New York, and Adjunct Assistant Professor of Neurology at Albany Medical College. Chris is the co-author (with Daniel Simons) of the New York Times bestseller and Editor's Choice book The Invisible Gorilla, and Other Ways Our Intuitions Deceive Us, published in 2010 by Crown in the U.S. and HarperCollins in the U.K., with translations published or forthcoming in Japanese, Chinese, Russian, German, French, Spanish, and thirteen other languages. In 2004 Chris and Dan shared the Ig Nobel Prize in Psychology (awarded for "achievements that first make people laugh, and then make them think") for the experiment that inspired their book. Chris's research focuses on three main areas: collective intelligence in human groups; individual differences in thinking and decision-making; and how cognitive illusions affect our lives. He has published papers on a diverse array of topics, including human intelligence, beauty and the brain, face recognition, the Mozart effect, behavioral genetics, group performance, intertemporal choice, chess expertise, and visual cognition. Chris's work has appeared in leading journals, including Science, Nature, Psychological Science, Nature Neuroscience, American Journal of Public Health, Journal of Risk and Uncertainty, Perception, and Cognitive Science, and it has been covered in major media outlets worldwide. Chris has spoken to audiences at PopTech, Google, Microsoft, Goldman Sachs, Procter & Gamble, government agencies, and elsewhere. Chris is a chess master, poker amateur, and games enthusiast; he writes the monthly "Game On" column in The Wall Street Journal. He also contributes occasionally to The New York Times, Los Angeles Times, Slate, and other national publications.